The Athenian Armoured Hoplites 5th to 3rd Century BC. 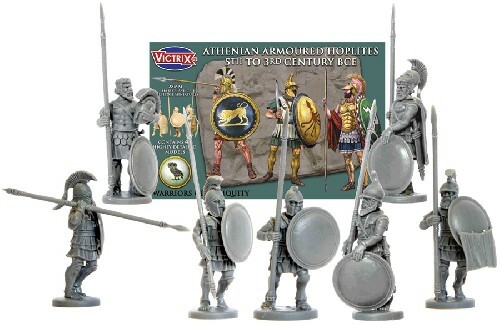 This fantastic set of miniatures represents Greek Hoplites of Athens and other Greek states from the 5th Century covering the wars with Persia, to the 4th century and the titanic struggle for Greek supremacy in the Peloponnesian war and the wars with Phillip and Alexander of Macedon. This set can be mixed with all the parts from the other 3 Hoplite sets, Spartan, Theban and Mercenary which all have their own speciality heads and options to add yet more variety to your Greek armies. Included in the box is a fantastic flyer produced for us by Great Escape Games giving you unit statistics for your Ancient Athenians to work with their Ancient Rules ‘Clash of Empires’, a superb set of rules that really capture the flavour of warfare in the ancient world. We have also produced sets of shield transfers designed by steve at Little Big Men Studios. These are listed on the shopping cart and will really make your Athenian shields stand out on the battlefield.